Native & Search Keyword Planner is a new search and reporting tool designed for Native & Search advertisers who need to capture market data for keywords, including historical data, forecasting, bid landscape and reach. Keyword Planner is a feature-rich extension to the Yahoo search family that lets you create and build keyword reports with a few simple clicks. Use Keyword Planner in your reporting workflow in the Native & Search UI by accessing the Tools menu dropdown. 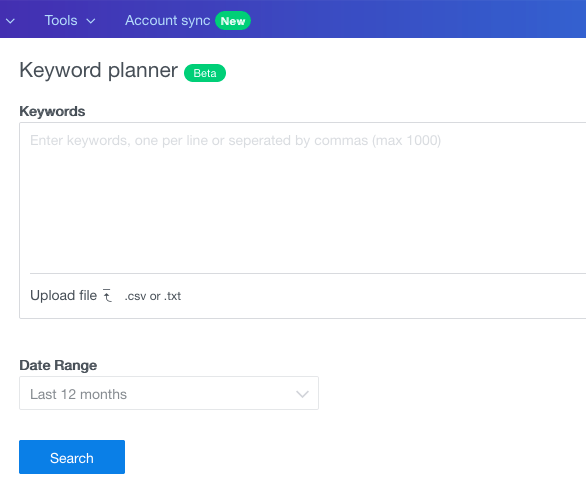 Once you upload a list of your keywords, you’ll be able to tap into the power of Keyword Planner by performing a wide range of reporting tasks on those keywords. Easy to use in the Native & Search UI, enabling you to generate performance reports based on your inputted keyword lists (either as .csv or .txt files you’ve uploaded) that display graphically average monthly searches, also searches by device trends, like Desktop, smartphone and tablets, filter competition on those keyword searches and specify targeting locations and date ranges. Similar for convenience to Google Keyword planner, thus reducing the learning curve for working with a new reporting tool. Unlock reporting features for Native & Search advertisers only previously available as metrics-viewing sales tools for managed accounts. Click Keyword planner from the Native & Search Tools dropdown menu. 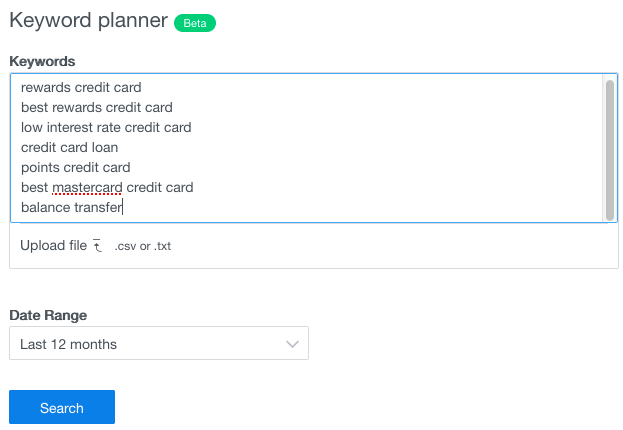 When the Keyword planner dialog appears, you can enter keywords directly in the Keywords panel or you can upload a .csv or .txt with a list of your keywords. The list should be comma-separated or contain only one keyword per line. In the current iteration of the Keyword planner tool, there is a maximum of 1000 keywords that you can enter or upload in a .csv or .txt file. In addition, the number of keywords you enter will equal the same number in the output displayed in the left panel. If no data is entered, dashes will replace the metrics. Once you perform an upload of your keywords, the Keyword planner displays your list in the Keywords panel. Note that data for the current month is not available. Based on your search criteria, the results appear in a dialog that includes a bar graph of your average monthly searches, a list of your keywords with metrics on the exact number of average monthly searches and a left panel for apply searches on specific keywords. In the bar graph at the top of the panel, you can view your average monthly searches over the data range you specified (in this case 12 months). In the Avg. monthly searches dropdown menu, you can also view average monthly searches by Device trends, including Desktop, Smartphone and Tablet. The bar graph displays device trends. In the left panel, you can enter new keywords and click Apply to create a graph to measure performance of those keywords in your list. In the Keywords panel at the bottom of the Keywords planner dialog, you can click the Filters dropdown menu. The filters are based on Competition measured as Depth – High, Medium and Low. Competition is defined as the number of impressions divided by the number of bidded searches, indicated by the term Depth. Click Competition and you’ll see a list of your keywords measured by Depth. 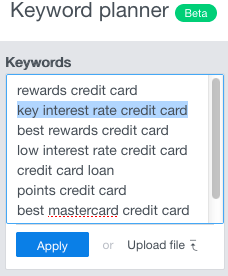 Click one of your keywords in the list at the bottom panel and a bar graph appears with performance metrics on that specific keyword, in this case, best credit card. Now click Download to download the sample output from that keyword search as a keyword-planner.csv file you can open and view in an Excel spreadsheet.